This is Parham Park, built in Elizabethan times for a wealthy old family fortunate enough to acquire the land in 1540, when King Henry VIII was busy dismantling monasteries. The land at that time passed from the Monastery of Westminster to the Palmer family, who began building their grand house in 1577. In about 1597, the Bishopp family bought the house and estate, and held it for about 325 years. In 1922, the Pearson family bought the property and found it in sad repair. They set about renovating, very conscientiously. The quiet but luxurious country life lived in this beautiful house has been about the same for centuries. It appears that over the years, the families who lived here were able to steer clear of the dangerous (and often lethal) political turmoil of their times. The house is pretty much in the middle of nowhere, close to the southern coast. After the excitement of hosting troops during World War II, the family decided they liked having people around and opened to paying visitors in 1948. The matriarch (think of her as the equivalent of Lady Violet on Downton Abbey) used to enjoy sitting in the Long Gallery, pictured below, as tourists filed through. She stayed anonymous and had a great time fielding questions and chuckling at inane comments. She especially liked it when complete strangers claimed that they had been guests of the family before the war–when she would have been their hostess. According to a friendly docent on a recent visit, the house has the third longest remaining Long Gallery in the country. These galleries were built in Tudor and Elizabethan times to showcase the family’s treasures. Just as importantly, family members used the gallery to take long walks when it was pouring rain out in their gardens and woodlands. Sometime in the 1960s, the family at Parham tired of the plain white ceiling of their Long Gallery. They had repaired and replaced the roof decades before, but the Gallery was beginning to bore them. So they hired an artist to add vines and branches. And some wildlife! 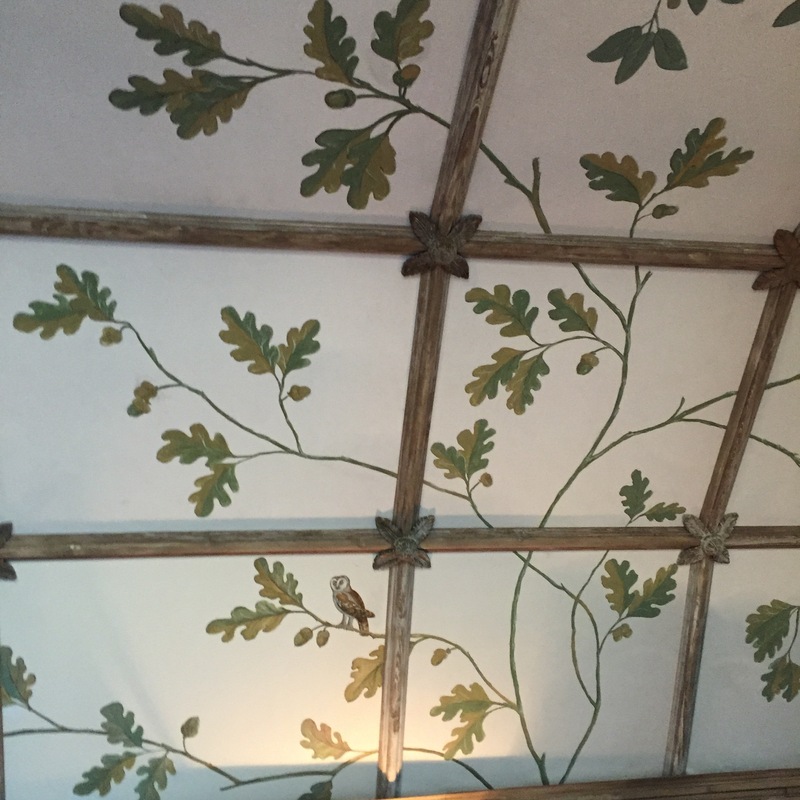 A little owl perches on a branch in the panel above. How about a pair of birds and their nest? My personal favorite is the monkey, who looks like he’s up to no good. 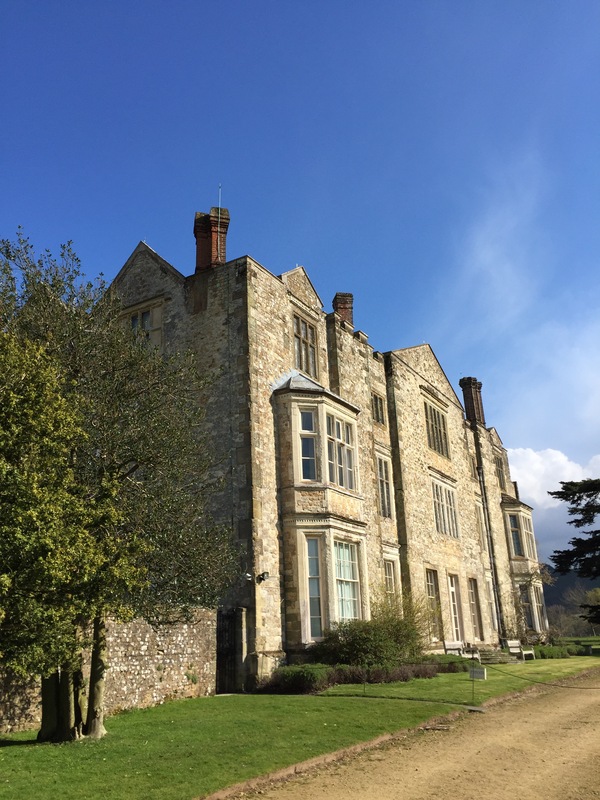 Parham today is managed by a charitable trust, and the Pearson family still lives in part of the house. 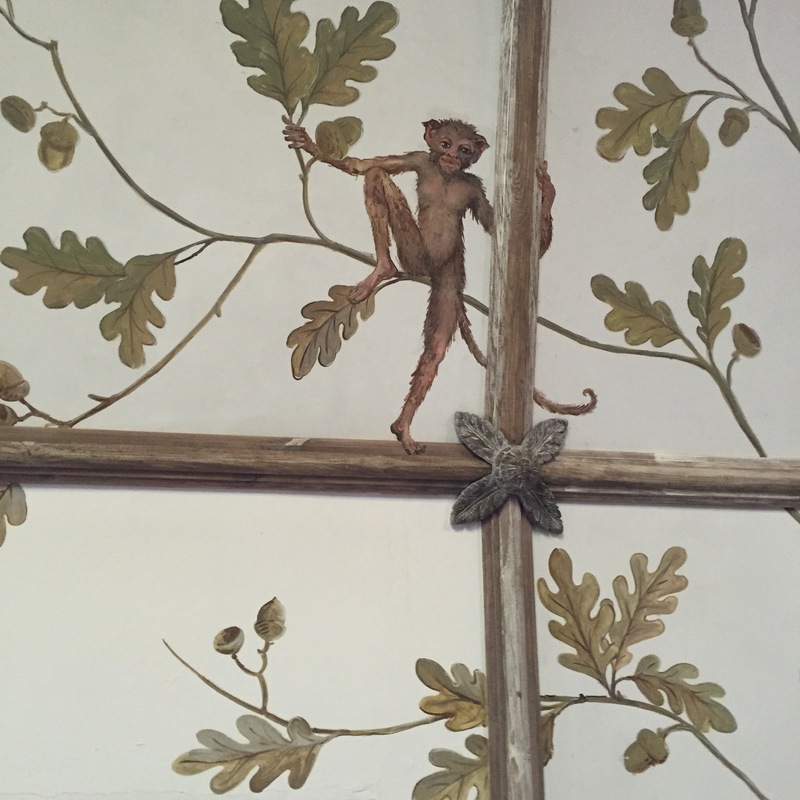 If Parham were run by the National Trust or English Heritage, painting vines and wildlife on the ceiling of the Long Gallery would probably never happen. Those organizations rightly insist on historical accuracy. 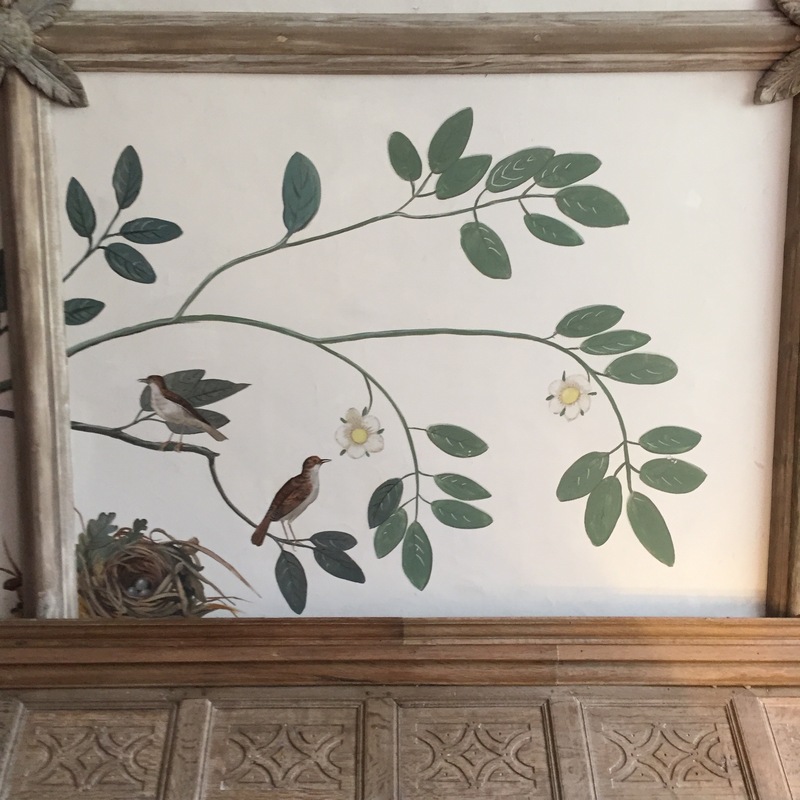 But since Parham was (and is still) privately owned, the family was free to do what private owners of stately homes have always done: make their home exactly the way they wanted it. The house is part of the Historic Houses Association, which sells a yearly pass that gets pass holders into many properties free, and into others at very limited times when no one else is admitted. 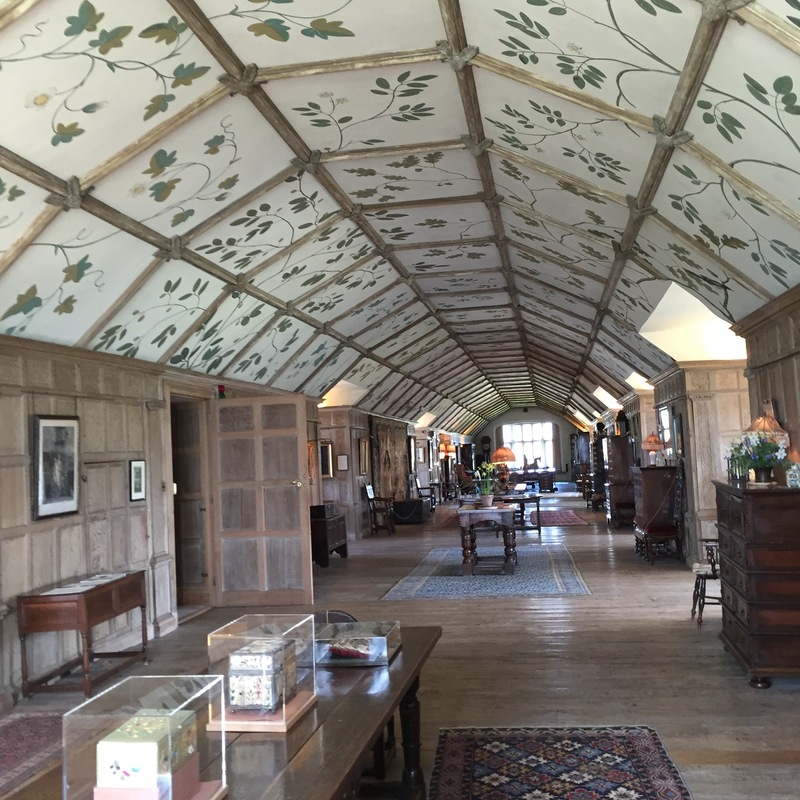 I’ll cheerfully flash my HHA pass at a house like Parham any chance I get, and I’ll return again and again to savor spectacular historic interiors like the dining room above. 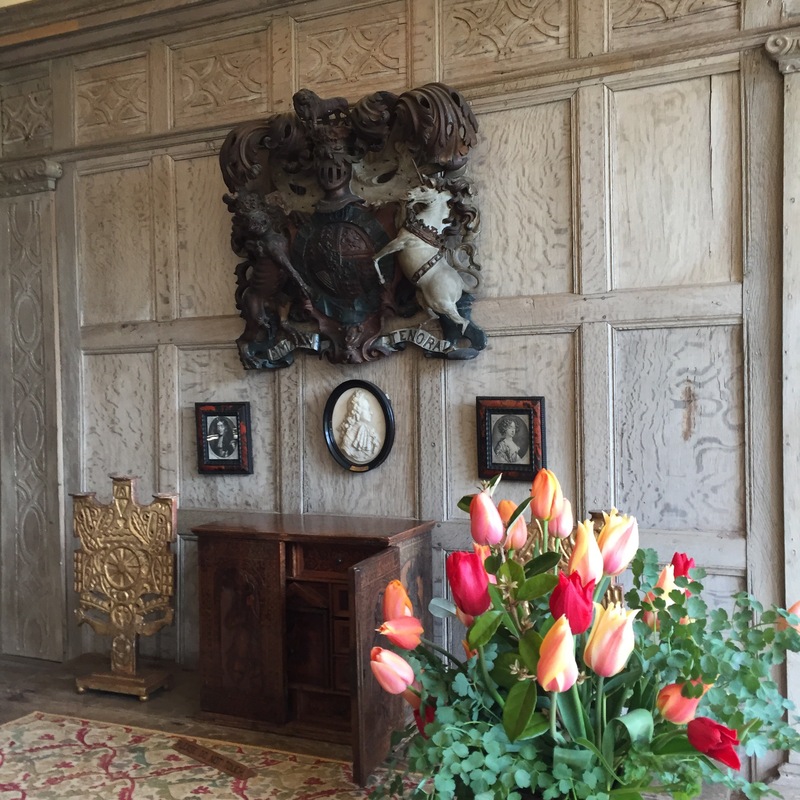 This entry was posted in Architecture, British Isles, England, Historic Homes, Why I Love England and tagged Long Gallery at Parham Park, Parham Park, Tudor and Elizabethan homes on June 3, 2016 by Claudia Suzan Carley.